BeerViking: Porter is black beer, but is it Schwarzbier? Porter is black beer, but is it Schwarzbier? German Porter, now there's a thing. There's quite a few about now from the more craft-inspired breweries, but they're usually more in an American Porter vein, so when I came across mentions of versions dating back at least to the early 1900s on Ron Pattinson's blog, I was intrigued. How did Porter get over there, I wondered – did it filter south from the Baltic? At the same time, Germany has its own dark beer styles, in particular Schwarzbier, which tends to be a northern and eastern speciality. These days, this is normally a black lager, malty, dry and medium-bitter, and sometimes described as black Pils (Dunkel Pils) although it's usually not as hoppy as a normal Helles Pils. I find many Schwarzbiers have a distinctive ashy note, although as the BJCP guidelines say, Schwarzbier doesn't usually have a burnt character. 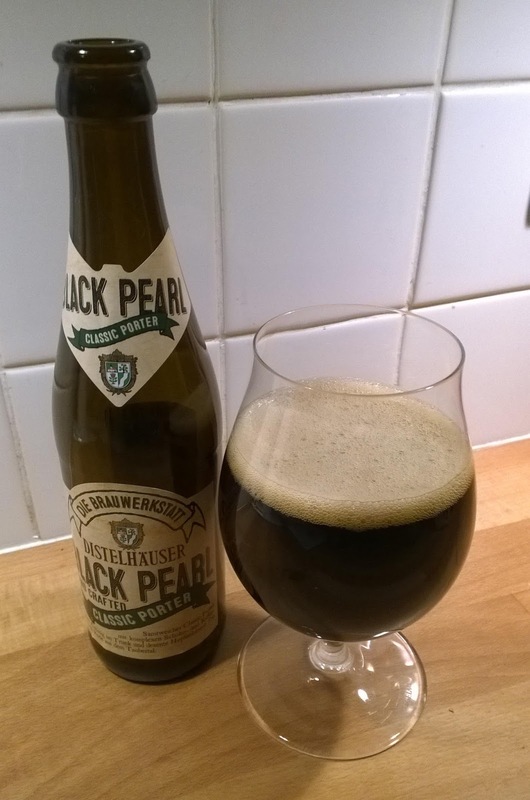 Anyway, when I spotted a new-to-me German Porter in the Getränkemarkt – Distelhäuser Black Pearl – I had to pick up a bottle. And extremely nice it was too – roasty and dry-bitter, with a little red-fruity tartness and hints of toffee and liquorice. But there too was something I hadn't expected: an ashy cocoa note that reminded me of nothing so much as Schwarzbier. Then back in London, a new-to-me English Porter – Dissident, from South London's Gipsy Hill Brewery. Again, very nice, and again those ashy-bitter cocoa and red fruit notes. In fact, my notes say it made me think of what a cask-conditioned Schwarzbier might be like. But if they're so similar, which came first and what's going on here – is it a case of parallel evolution, or an exchange of ideas among brewers, or has modern Schwarzbier somehow evolved from a bottom-fermented Porter?! When I dug into the subject, it turned out that there's a bit of truth in all three options. Schwarzbier in the general sense of dark beer is an ancient thing everywhere – for example, archaeologists found evidence of dark beer in an iron age Celtic tomb in northern Bavaria, dating to around 800 BCE. With the end of the middle ages, beer began moving around – by the 1600s, England was importing a heavy sweet North German beer called Mumme (or Mum), which appears to have been regarded as a black beer. By the 1700s, the Porter brewers of London were producing strong matured beers for export, and so were the Schwarzbier brewers of Köstritz. Things moved some more in the late 1700s and early 1800s. According to local archives translated on the Zythopoeia blog, English Ales and Porters became very fashionable in Germany, and of course the local brewers worked to copy them. Interestingly, just like English brewers of Sweet Stout and Brunswick's Mumme brewers, by the late 1800s they were marketing their sweet Schwarzbier as a great tonic, suitable for invalids and breastfeeding mothers. So there it is: the parallel evolution of dark beers, plus the introduction of new ideas from abroad (whether from Germany to England or vice versa), the effects of fashion, and of course brewers finding out what works. Porter and Schwarzbier aren't quite the same thing, but they are much closer cousins than many people might realise. My hobbies are beer and the Viking Age, hence BeerViking. I also have a full-time job writing professionally about other stuff, which is why I don't have nearly as much time for beer-blogging as I'd like! A life member of CAMRA, I love both real ale and fine craft beer - and yes, those two definitions have a large overlap. Although I'm London-based, I spent a year-and-a-bit living in Northern Germany, so you'll find German beer covered here alongside the real ales. And to be honest, alongside just about anything else that's good in the way of beer!